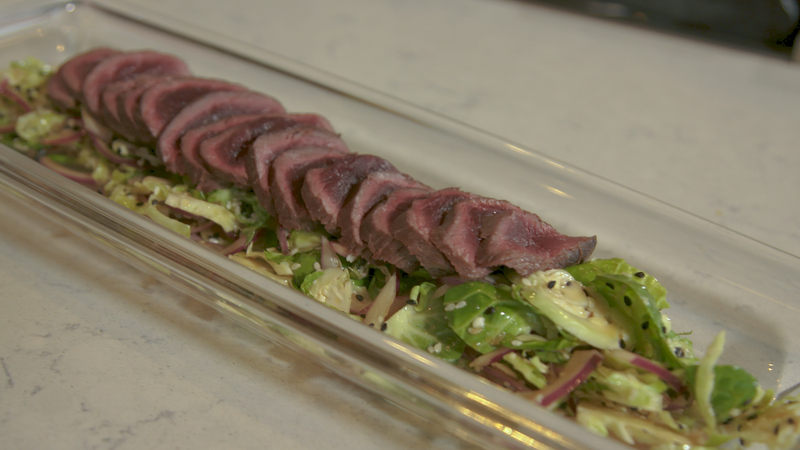 Crunchy, fresh and tasty, Dan’s Japanese spin on seal meat will definitely seal the deal on being delicious. • Heat frying pan on medium-high heat. Once the pan is smoking hot, add small amount of canola oil, followed by a piece of lean, boneless seal meat, seasoned on all sides with salt. • Sear the meat on all sides until browned, about 30 seconds per side. You want a piece that is ideally square so that it cooks evenly on all sides and leaves the inside rare. • Remove the seal, and immediately wrap it in a piece of saran wrap and place into a freezer to stop the cooking process. • After 10 minutes, remove from freezer and unwrap. • Slice the seared seal meat into thin slices, about ¼ inch thick. This should reveal a seared outer ring and a rare inside. • Arrange the slaw in a long line along a rectangular plate. Top with slices of the seal tataki. • Dress the meat with any remaining slaw dressing.